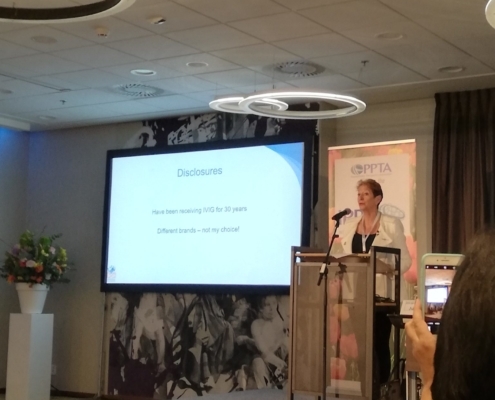 The International Plasma Protein Congress (IPPC) took place in Amsterdam on 19 and 20 March 2019. This year’s edition was very much focused on the challenges for patient access and the need for more plasma in Europe. Jose Drabwell, IPOPI Board member, was a speaker during the first day and she called for joint stakeholder collaboration to tackle the current immunoglobulin and other plasma-derived medicinal products’ supply tensions affecting people living with primary immunodeficiencies (PIDs). Prof Martin van Hagen (Erasmus University, Rotterdam), IPOPI’s Vice-Chair of the Medical Advisory Panel, provided a clear overview of the reasons why immunoglobulins and biological products are not the same and how the specificities of the patient and of the disease should be taken into consideration before the administration of one particular biosimilar. The second day focused on the challenges and perspectives from a regulatory perspective. Jacqueline Kerr, from the Paul Ehrlich Institute, gave a fascinating presentation on the recent developments with immunoglobulins. In the section dedicated to international challenges and perspectives, Prof Antonio Condino Neto, introduced participants to the Latin American Society for Immunodeficiencies (LASID). This year’s Hilfenhaus Award was for Prof Isabella Quinti, professor of Clinical Immunology at the Sapienza University of Rome (Italy), for her long-standing dedication to primary immunodeficiencies.